The biggest Rainbow of the week was taken by Al Owen – this 6lb 15oz specimen was caught on Wednesday. Another Rainbow of note. again fishing in the ‘Fry Bashers’ fell to Mark Hamblyn who brought a 5lb 5¼oz fish to the scales. Rainbows in the 3lb bracket are being caught to many methods from dry fly to fry patterns and tube flies. Browns have again been on the feed with the best reported by a party of Scottish anglers with one of them returning a 7lb 8oz fish last Friday. Season ticket holder Barry Vaughn from Peterborough hooked into a 6lb 8oz fish from down the South Arm, whilst there were further fish of note with Barry Fox fishing in the Fry Bashers taking a 6lb 5oz fish, and in the same competition Dave Shore had a 6lb 4oz fish while earlier in the week season ticket holder Graham Pearson had a 6lb 4oz fish from the South Arm. Please note that the Brown trout season finishes next Wednesday 29th October after that date all Browns caught must be returned back alive to the water. Unsettled weather during the week restricted fishing with boats unable to go out last Monday and uncomfortable conditions on Sunday. However, despite the weather, a number of fish were caught both from the bank and from the boat from many areas of the reservoir. Settled weather with the wind remaining in the same direction for a few days would help things tremendously, and with the weed slowly dying back there will be more and more food available close in to the shoreline as the fish feed on the plentiful supplies of fry, corixa and snails. This two day event was run by Chris Guthrie – the first day was hosted at Grafham and the second at Rutland. Anglers were faced with gusting westerly winds throughout the day making conditions difficult. Top rod at Rutland was season ticket holder Keith Jones who took seven fish for 15lb 8oz. Keith took 5th place overall. Best Rainbow 6lb 15oz taken by Al Owen of Cranwell. Best boat areas The main basin and around the shore lines of the reservoir from New Zealand Point to the Church. Bottom of the South Arm. Best bank areas New Zealand Point to Sailing Club. Fishing Lodge to the Dam. Finches to Armley Wood to Carrot Creek. Best methods Bank – Fry patterns/dries. Boat – As for bank but include mini lures and tube flies. Mid week boat winner Roy Taylor of Oakham. Sale – throughout November we have reductions of up to 30% on a wide range of tackle and clothing at each of our tackle shops. Beginners courses: 25 October; 1 November. Grafham Water has fished well over the past week for both bank and boat anglers with a healthy rod average of 3.74. Bank anglers have had a great week’s sport with plenty of limits taken – mainly from the south shore. The most successful areas for the bank anglers have been Plummer bank, south and bowl of Dam, Seat, Mander car park frontage, Pylon Point, Hill Farm and G Buoy. The most successful tactics for the bank anglers have been floating or intermediate lines with diawl bachs, GRHE, shrimp patterns, cormorants and minkies. Season ticket holder Kevin Donovan from Shefford has had a tremendous week’s fishing. Kevin has caught and released 42 trout in seven visits by fishing Diawl Bachs on a floating line at Plummer Park. Boat anglers have enjoyed good sport mainly by fishing the same methods as the bank anglers. The most prolific boat areas have been A,Q,L and G buoys, Marlow Bay, Bowl of Dam, Plummer Park, Sanctuary Bay and Valley Creek. 100 Anglers took part in this two day match run by Chris Guthrie – the first day was hosted at Grafham and the second at Rutland. Day One at Grafham fished exceptionally well with the 100 anglers catching 417 trout for an impressive rod average of 4.17. Best Brown 4lb 14oz taken by Kenny Miller. Best boat areas Valley Creek, A,G,L and Q buoys, Gaynes Cove, Sanctuary Bay. Best bank areas Plummer bank, South and Bowl of Dam, Valley Creek, G Buoy, Hill Farm, Pylon Point, Seat. Mid week boat winner B Taylor. The changeable weather conditions have again played their part and the fishing has been difficult at Pitsford. The Anglian Water versus Environment Agency match on Tuesday was won by Anglian Water with Darren Smith as top rod – Darren was the only angler to catch his limit. Jon Marshall was second with six fish and Andy Ainscough took third with five fish. The match fished to a healthy rod average of 2.8. Best methods on the day were either fast sink lines with fry patterns or slow glass and boobies pulled across the top. Best areas are the Causeway or Brixworth Bay. Bank anglers are reporting improving sport now that the weed beds are starting to die back. Fish are being taken right in the margins on Daddies and dries. Sailing Club bank has been producing a few fish on this method. Lots of good Browns have been reported – the best, a lovely fish of 6lb, taken by Dave Wood. 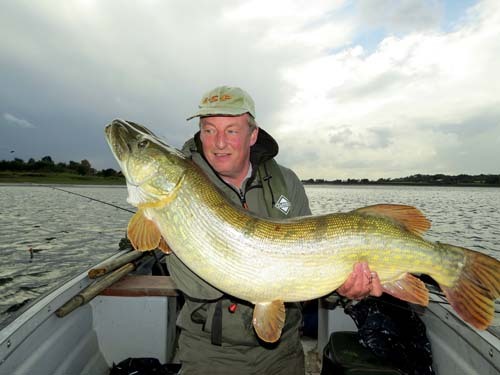 Predator anglers have continued to report lots of sport from both Pike and Perch. Neil Bridges has enjoyed some fantastic predator fishing recently but nothing has beaten the 33lb 4oz Pike he caught on a whole herring at Pitsford. Best Rainbow 4lb taken by J Juckes. Best Brown 4lb 7oz taken by Ben Farnsworth. Best boat areas Main Bowl, Brixworth Bay, Narrows, margins, edge of weedbeds. Best bank areas Margins and Sailing Club bank. The early part of the week at Ravensthorpe was challenging with very poor visibility in the water. However, on Sunday there was a vast improvement with some impressive catches. Earlier in the week anglers also managed numbers of fish with Mr Watterson bringing ten to the boat on various lures. The fish appear to be concentrated around the reservoir’s margins particularly between Monger Bank and Tall Willows and also between the Island and the Catwalk. The fish are not feeding hard. There are numerous Roach and Perch fry in the margins and some trout have been observed crashing through these shoals at times. Mick Griffin held his Fur and Feather match on Sunday – this was a well subscribed friendly, match. Winners were Simon Farmer, an AW warden and Graham Bayes. Between them the pair netted 8 fish for 17lb 11oz, taking their fish anchored between the Island and Catwalk, about 40 yards from shore. Second place went to Stuart Payne and Mike Osgood with 6 fish for 16lb 2oz. Stuart also had a lovely 4lb 6oz fish in his bag. A well deserved third place went to Dave and Denise Davis who fished various pink fritz lures and cormorants to take 8 fish for 15lb 7oz. The big fish trophy went to another member of the warden team – Mitch Brown took a lovely 5lb 1oz fish on a Pitsford Pea. Mick and Sandra Griffin did a fantastic job on the prize hampers and everyone enjoyed a steak and kidney pudding at the Chequers pub afterwards. Some bank sport has been had along Monger Bank and fish are showing close in. A roving approach with floating fry or suspender minkie on the point and diawl bachs on the droppers is well worth a try. Don’t miss out on Anglian Water’s popular Fur and Feather at Ravensthorpe on 2 November. Please call the Fishing Lodge on 01604 770875 to reserve a place. Best boat areas Mongers, Island to Catwalk. Best bank areas Mongers, Dam. Mid week boat winner Kevin Daykin. Ravensthorpe Fur and Feather (boat) 2 November.